On Saturday morning September 16th, members of HBCPN joined together with the goal of painting the dorm rooms of one of MHY's several (cabins/dormitories). Each of the 12 rooms was prepped for painting by removing switch and outlet covers and covering beds with drop cloths and tape as needed. Trim and cutting-in was accomplished and then main wall painting. Our team worked with the maintenance staff and knocked this out in 6 hours. There was no need for Michelangelo, just willing individuals with servant hearts. This outreach enabled other members of our church to serve MHY who aren't interested in working directly with kids, but still desire to help out the organization and the kids. One of the best parts of this service was a sneak peak into what life is like for these kids outside of the evenings we get to spend with them sharing the gospel and playing games. It enabled us to see behind the scenes and where they sleep, what their room and personal quarters are like. As we worked we were praying for each kid while we were painting their room. Their name was posted at the door. Just a nice chance to pray for them and God working in their life as we were serving them. The other "surprise" was the observation of one of the Bibles that we had previously handed out to the kids. It was on top of their other books and binders. It was just a reminder that we are doing a good work here and helping to share the word of the Lord with these kids. It's encouragement as well to keep on going and not to give up. To continue sharing Christ's love for his kids here at MHY. Please join me at the next outreach that is scheduled for Thursday October 26th starting at 6PM. The Roof Has Been Raised and so is God's Glory! It doesn't get any more "GQ" than this friends! Lookin' tough on the roof! The beauty of this particular project is that we were able to come together as a church and take care of one of our own. 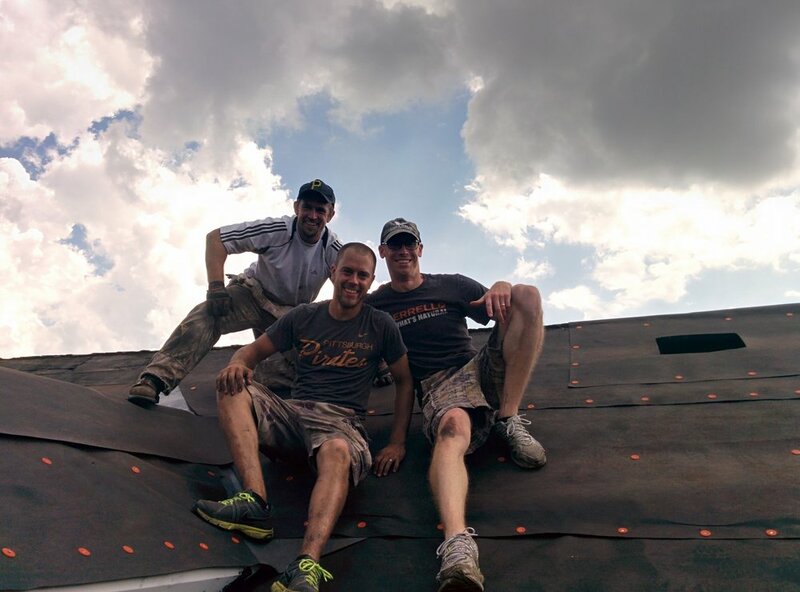 In less than a month we coordinated a monstrous day of replacing a leaking roof for the Zeleznak family. Funds were raised, people were rallied, food was prepared, prayer was given, hugs were had, tears were shed, shingles were removed, beards were made fun of, laughter was abundant, hard work was given, joy was shared, but most importantly God was GLORIFIED!!! This has surely been a very busy August and summer for the church. But next time there is the opportunity to help those in need, we pray that you jump at the chance to see what God does in your heart when you pour out blood, sweat, and oh yes many many tears for His kingdom, for His glory, for His church! Forever you'll be changed!!! In the 2016 winter quarter, the Murphy Small group teamed up with Hosanna Industries by helping an elderly woman named Linda with her home in Mckeesport, PA. She lived by herself, already had one knee replacement while awaiting another and could not do much with the dampness in her basement. Russ, Mike, and Ben traveled down together on the coldest day of the year to help scrape off old mortar, dust, and then dry-loc her basement walls to keep the moisture from seeping in and the mildew out of her home. She was very appreciative of the work and we enjoyed our time together working to further His kingdom with some good old fashion sweat and sore hands. Check out the brief video below to see the work that was done in Linda's home.